If you’ve been tapping my phone calls or you have psychic powers, you’ll already be aware that Elena and I have now concluded our search for a new home, a process that scoured the whole of south-east England and involved evicting a large number of people whose homes we thought we liked but then – tragically for those involved – decided weren’t quite right. The Beans must, naturally, get the exclusive scoop on our new lodgings, so this post is here to present all the key details. 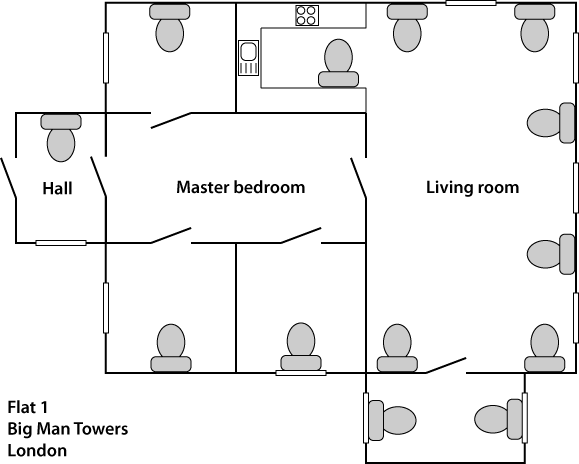 Unfortunately no photographs of the dwelling are available at this time, but I am able to present the floor plan, as drawn up by the estate agent. The main things we were looking for were space, lots of natural light, easy access to a station, and sufficient bathroom facilities. On the last point we had already ruled out apartments with just one bathroom on the grounds that, if we both needed a wee at the same time, it might start an argument. We then wondered what would happen if we had a dinner party and everyone wanted a wee at the same time – clearly some sort of ugly fracas or kerfuffle would ensue. We were, therefore, delighted to find a home that anticipated this requirement – and, thanks to extremely innovative placement of its toilet facilities, it also has the advantage that during a dinner party everyone could simultaneously micturate without leaving the room and therefore without needing to interrupt the flow of the conversation. And of course, when there’s only the two of us, we can more or less go to the toilet wherever we are without having to move. We look forward to welcoming you to our new home once we’ve moved in. Please bring your own toilet roll. At the party, are you going to include the toilets in some sort of exciting game? I would recommend blindfolding someone and putting them on a wheely chair. Spin them round until they’re dizzy and see if they can pee into one odour many toilets. To be honest I’m surprised you accepted this flat too. There is a distinct lack of loos in the master bedroom. You’d think with the rest of the flat being so well appointed theyd’ve put a few in there too. There’s also a lot of broken walls. You might want to get them fixed before you sign the lease. In London we call broken walls “doors”. Everyone’s got them. They’re right on the fashions. If only you knew how Chris convinced me the flat we were viewing actually had random toilets on the walls… I believed him until we got to toilet number 3. Are you planning the give the toilets names or just numbers? I think I could make some really nifty knitted signs if you were interested. I can’t knit but I think with several years under my belt I’ll be the best. I was going to refer to each of them by their exact latitude and longitude. It would be difficult to remember them all and would take a long time to say them out loud, but I think the high degree of accuracy would outweigh those problems. I would be very impressed if I was at a house or flat party, stuffing me viso/volto with Doritos, and the host was cracking off coordinates like they were place names. I’d open my mouth to that. And, as an excellent host, I would place a dip-loaded cheesy flavour Dorito into that open mouth. How very sensual. A bit too sensual for my liking, but I’d be off my face on too much cheeky dragon to notice. I’ve done it loads of times before and you’ve never yet been sober enough to notice, so I wouldn’t worry about it. I hope I was conscious otherwise I’m calling the police, or Big Frank. I did it using a funnel once. You were conscious, but hugging a pillow and complaining. Chris filmed it. Does that count?